Wine cork crafts are incredibly fun, and they are a wonderful way to use up the corks from your favorite wines. The problem is that cork is a difficult material to cut. It can break and crumble, and it's far too easy to slip and cut yourself. The key to safe and successful cutting is to use the right process and tools for the job. Before you begin cutting, you'll need to get the corks ready. Proper preparation helps prevent the cork from crumbling as you work. Fill the bottom of the pot with an inch or two of water. Place the steamer basket on top and allow the water to come to a boil. When the water is boiling, drop a few corks in the steamer basket and replace the lid. Allow the corks to steam for 10 minutes and then remove them. They will be easy to cut! Cutting corks evenly the long way can be tricky, since they tend to roll around. The trick is to prevent them from rolling. You don't need a lot of woodwork experience to make a tool to help. Place the piece of plywood on your work surface. Apply epoxy glue to the two-inch side of one of the one-by-twos. Line the long edge of the one-by-two up with the long edge of the plywood, glue side down. Use clamps to hold it in place. This creates an edge to keep the corks from rolling. Place several corks lengthwise on the plywood along the edge you created. Slide the other one-by-two onto the plywood so it forms another edge on the other side of the corks. Use a pencil to mark its placement. Remove the corks and glue the other one-by-two in the place you marked. Use clamps to secure it while it dries. When the glue is dry, remove the clamps. Use the ruler to measure the distance between the one-by-twos. Mark the middle in pencil on both ends. Glue a one-inch section of one-by-two on either side of the pencil mark at the end of the longer pieces. These will serve as a guide for your saw and will keep the corks from moving out of the channel you made. Place a line of corks in the space between the two one-by-twos. They are now held securely between the two long pieces of wood and cannot roll. The one-inch pieces on either end hold them in the channel and tell you where to cut to divide them into two even pieces. With the hacksaw, carefully cut the corks down the middle, using the small pieces of wood on either end as a guide. To cut corks the opposite way, you'll need another tool. This is even easier to make. Apply epoxy to the widest part of one of the one-by-two pieces. Align this piece with the edge of the plywood and use a clamp to secure it. Place a cork on the plywood next to the one-by-two. With epoxy and clamps, affix the other piece of one-by-two on the other side of the cork. Remove the cork and allow the glue to dry. When the glue is dry, remove the clamps. Place the tool you made on top of a cutting board. Place a cork in the groove between the two pieces of one-by-two. Adjust so half the cork is in the tool and half is sticking out. With the hacksaw, cut the cork along the edge of the tool, making sure the cutting board is under the cork in case your saw slips. 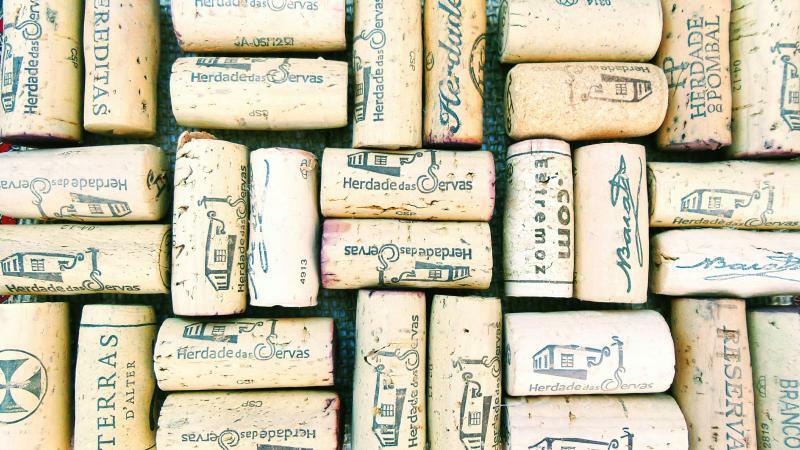 Whether you're making wine cork art or just playing around with the old corks, they are far easier to cut if you use the right tools and methods. If you soften the corks first and make a wooden tool to hold them, you can safely and quickly cut hundreds of corks to use in any way you like.